This technical note will provide step-by-step instructions of how to do create ZIP/RAR files. >For Mac OS X users: Mac has built-in support for zipping and unzipping files. Comparing to ZIP file format, RAR provides a number of advanced features: more convenient multi-part (multi-volume) archives, tight compression including special solid, multimedia and text modes, strong AES-128 encryption, recovery records helping to repair an archive even in case of physical data damage, Unicode support to process non-English file names and provides potentially greater data integrity for ESI transfer and archiving. >For Windows users: If you want to upload multiple documents, productions and loadfiles to you case(s), please note that Lexbe eDiscovery Platform will only support batches of files that have been compressed in a 'ZIP' format using WinRAR utility to optimize our system's performance. You can still upload individual files without zip compressing; however, when you are working with document sets then you must compress the collection into zipped files. 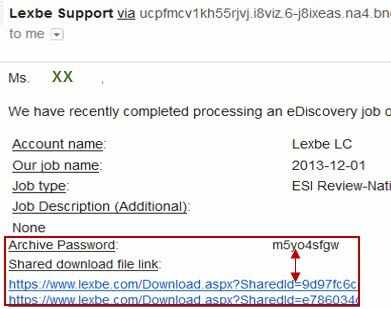 Lexbe eDiscovery Platform will automatically extract (unzip) the files and you can choose to get notification by email when an upload completes. We cannot accept unzipped files because it might cause data corruption or errors during the file processing, and they also take much longer to upload and download resulting in lost time on the job. For Mac OS X users: Please use the built-in utility for creating the zip files as part of the Lexbe upload, production upload and loadfile process. When you download files using Download Briefcases or Download Production features, our system will compress multiple documents in a single ZIP file that you can download and expand back to its original size. The expanded file is identical to the original file before it was compressed and you can choose to get notification by email when a download completes. >Open the zipped file that you would like to decompress. We recommend that you download and save to your desktop. >Right-click on the zipped file and choose 'Extract Files Here' to extract the files directly to the folder that the file is already located in. You can also choose 'Extra Files', which will open the WinRAR application to give you more extraction options. >Choose the update mode you'd like to use along with the overwrite mode if you are replacing files for the same compressed file (this will appear on the left side of the screen). >Finally, set the destination path, which is automatically set to the same folder as the file, though it does create a folder with the file's name for decompressing the file. After completing a job opportunity, our technical support will automatically send out a notification email called 'Lexbe eDiscovery Services: notice of eDiscovery job completed'. The email notification will include shared download links and archive password that you can decompress with WinRAR utility for Windows platform or other RAR utilities available for Mac. One of the RAR utilities available for MAC and similar to WinRAR is SimplyRAR. Once you install the utility, please follow the same steps described for Windows Users when compressing files in a RAR format. 1-Archive Password and Download Links. When we prepare an archive of files for download, it will be password protected to be used for extraction. >Download all the shared download links provided to your upon the eDiscovery Job completion, saving to your local computer. >Right click on the file(s). To extract the file to the containing folder click 'Extract Here' from the pop-up menu. To choose a different location and click 'Extract Files'. >If you choose the 'Extract Files' option from the pop-up menu, choose a destination in the right side of the menu by using the file explorer. Use the expandable and collapsible menus of the explorer to find a location for the extracted files to go. >After locating the destination through the file explorer click 'OK'. The files will be extracted to this location. >Archives are part of single archive (split) and they cannot be separately extracted or renamed. Must be extracted as a group. >They should not be extracted on the flash drive as there may be insufficient space, and instead should be extracted on a local HDD with sufficient space. >Archives are encrypted and password protected for security in case a flash drive is mis-delivered or lost.